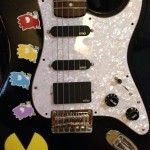 I finally finished the setup on my Badtz Maru Pac-man guitar. My last update was finishing up painting and assembly. The original goal of this project was to make a “boutique” guitar that was more about the visuals than the sound. After finishing the setup and installing the electronics, I’m flabbergasted by the output of this guitar. So flabbergasted that I used the word flabbergasted. I did a little research on the kind of electronics I wanted to put in. There are a couple of brands to choose from: Fender, DiMarzio, Seymour Duncan, Lace, and EMG. The sound of a Fender guitar is very specific. 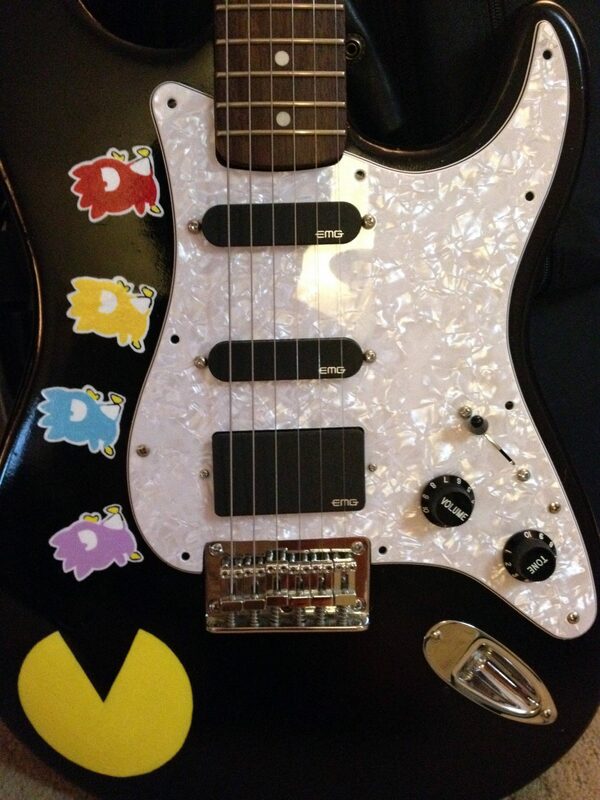 I thought I wanted to take the traditional approach and go with true Fender pickups but it didn’t make sense to only have Fender sound on a custom guitar with Badtz Maru and Pac-man on it. Then I thought I wanted to go with DiMarzio and a set of Area ’58, ’61, and ’67 pickups. A guitar buddy of mine loves the sound of DiMarzio pickups and I thought about getting these pickups for a good 6 months. In the end, I decided to go with EMG pickups. Part of the reason is because my PRS Paul Allender has a set of EMG 89 and EMG81TW and I love the sound it puts out. The other reason is because one of my favorite lead guitarists, Kirk Hammet, uses EMG pickups. Instead of trying to figure out a good combination of pickups, I decided to go with a prewired setup. Prewired means the company adds the pickups to the pick guard and all you do is add a battery and screw it in. If not, then I would have to unpack my soldering iron and make a few mistakes before getting it to work. EMG’s Solderless Install System is truly the way to go. The set I got was the KH20. This prewired setup contains: the 81 (similar to my Paul Allender) and 2 single-coil pickups. The 81 has a great sustain and extremely high output. The pair of single-coils do not hum. One of my Fender friends tried it out and the first thing he said was that there wasn’t any hum. Usually, to get this done you’ll need a roll of copper tape to shield each pickup from the other. These single-coil pickups are very clean and give me the Fender sound when I want it. The guitar is a Fender Bullet, the cheapest and lowest quality Fender guitar you can buy. In fact, I only bought it for $75. After artwork and putting in new electronics, I turned a $75 into a $1000+ beast for under $300. I’m really happy and excited about this mod. Next mods to it? Change bridge, add a better nut, and better tuners.